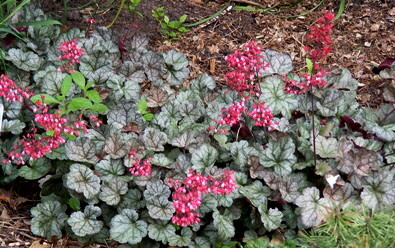 Heuchera, also known as Coral Bells, are a great alternative to hosta. They are known for their dramatic foliage adding texture and interest to the shade garden. There are at least 50 species of Heuchera that are native plants throughout North America. Heuchera sanguinea is a southwestern species with excellent pink flowers that is commonly crossed with hardy species to form our favorite garden Coral Bells. Heuchera nivalis are tiny alpine plants native to the Rocky Mountains, Heuchera maxima are tall and heat loving native to California, and many others that offer special traits in hybridizing. The purple foliaged species Heuchera americana is frequently a parent of many of our favorite garden Coral Bells. Coral Bells are generally grown for their outstanding foliage but they also offer an extensive variety of blooms. Heuchera americana are generally only about two feet tall and wide with large lobed leaves in a variety of colors and textures. Small bell shaped flowers are held on tall stems. They are ideally suited to woodland gardens, preferring moist well drained soil that is organically enriched. Damp shade can be a problem, inviting fungal diseases, simply moving the plant to a drier sunnier site will solve the problem. Even Coral Bells that are sun loving may benefit from some shade in the hottest part of the day, and extreme heat or full sun may discolor the foliage. Heuchera don’t require much maintenance, just cut back the flower stalks when the blooms are spent and divide every few years. The center of the plant will die out over time, so discard old centers and replant young outer sections. Each spring top dress with compost or a balanced organic fertilizer. In cold regions Coral Bells should be mulched heavily just after the soil freezes to prevent heaving. Hummingbirds enjoy the flowers of Coral Bells, and the foliage may occasionally be nibbled by deer. Coral Bells can be expected to live about 10 years under ideal conditions. 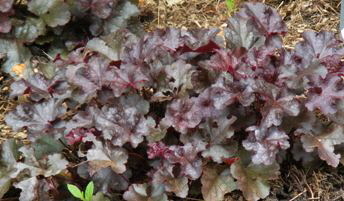 The ‘Dolce’ series of Heuchera were developed by Dan Heims. The rich summer foliage colors and dramatic fall tones with interesting mottling and contrast veining are quickly becoming a staple of gardens everywhere. The cultivar names are as rich and delicious as the plants. Foliage: Purple-burgundy with gray green veining and silver overlay. Pest and Disease Resistance: Good resistance to powdery mildew, no serious insect or disease problems. Somewhat susceptible to heuchera rust and root weevils. Fertilize: Use a balanced organic fertilizer in early spring or top dress with compost. Container plants may require additional fertilizer mid and late summer. Maintenance: Very minimal care required, mulch in regions with cold winters. Hardiness: Zones 4, 5, 6, 7, 8, 9 Evergreen in warmer regions, generally at least zone 6. Dolce Blackcurrent has purple leaves in spring that mature to burgundy. Leaves open with gray green veining and a silvery overlay, the veining deepens to burgundy as the foliage matures. In cooler climates brighter pink accent colors will be present. The flowers are fairly insignificant on ‘Blackcurrent’. The mounded plant is about 12” tall. Thin stems rise above the foliage at about 16” and produce spires of tiny flowers in late spring. Plant in full sun in northern climates, but provide some afternoon shade in hot southern regions. Do not allow the soil to dry out or the leaves will scorch and wilt, remove damaged foliage with a garden shear. In extreme or extended heat the plant may go dormant. ‘Dolce Blackcurrent’ provides wonderful contrast against the brighter greens of hosta or other coral bells. Hardiness: Zone 4, 5, 6, 7, 8, 9 Evergreen in warmer regions, generally at least zone 6. ‘Creme Brulee’ has outstanding leaf form with very rounded lobes. Foliage emerges a rusty orange color and matures in cool temperatures of late season to a golden bronze, hence the name. The foliage color can be quite variable depending on temperatures and conditions, but seems to be always rich and vibrant. Heuchera ‘Amber Waves’ is the seed parent and contributes to the fine foliage coloring. Fine burgundy stems bearing small stalks of dark red buds that open to tiny rose flowers rise 22” above the foliage in June and July. Hardiness: Zone 4, 5, 6, 7, 8, 9, Evergreen in warmer regions, generally at least zone 6. Brilliant heart shaped leaves with scalloped edges are a stunning chartreuse and deeper colored veining, “Key Lime Pie’ is sure to brighten the dullest spots in your garden. The color will deepen and become a more intensely lime green and eventually mottled with shades of burgundy in cool temperatures of fall. ‘Key Lime Pie’ holds its’ color very well all season long. Long stems hold spikes of tiny bell shaped pink flowers in spring to fall. These lighter and brighter cultivars will generally adapt best to heavier shade. “Key Lime Pie’ is a hybrid cross between ‘Amber Waves’ and ‘Huntsman’. These are the same parents of ‘Lime Rickey’ which has white flowers and ruffled leaf edges. ‘Key Lime Pie’ has a small somewhat spreading form, excellent for a ground cover or spilling over containers and as filler for other container plants. Will do very well in heavier shade. ‘Licorice’ is a dramatic, almost black coral bell. The glossy foliage has purple black leaves with silvery mottling and gray green veining. Deep pink to red buds open to tiny creamy white flowers are held above the foliage on 16” long stems from spring into summer, a nice complement to the foliage. ‘Licorice’ will stand up to sun and heat fairly well but will benefit from afternoon shade in hot regions. Keep well watered in extended periods of heat. It is also quite cold tolerant and will do very well in zone 4 “Licorice’ can be expected to live about 10 ten years in ideal conditions. Divide to propagate and maintain the health of the plant. Small silvery leaves will glitter in your shade garden with excellent veining giving the foliage really beautiful contrast. ‘Mocha Mint’ forms an 8-12 inch slightly spreading mound that is perfect for a ground cover or filler plants for container gardening. Blooming tends to be a bit later than many of the coral bells, appearing in June and continuing into July. The spikes of tiny coral red flowers are held on 16” slender stems. The foliage remains fresh all season. ‘Mocha Mint’ is quite cold tolerant and will do very well in zone 4 It can be expected to live about 10 ten years in ideal conditions. Divide to propagate and maintain the health of the plant.